ALEENTA Resorts recently hosted two charity dinners to raise both consciousness and cash for threatened marine environments and victims of Thailand's recent devastating floods. At Aleenta Phuket-Phang Nga, a crowd of more than 100 VIP guests turned out to support the "Help Save Marine Life'' charity dinner recently at the resort's beach bar and lounge The Edge, overlooking pristine Natai Beach. And the following week, sister resort Aleenta Hua Hin-Pranburi held a banquet for a select gathering of guests, at which the cream of the region's chefs, including the resort's own two Michelin Star-awarded resident manager James Noble, collaborated to take guests on a gastronomic journey inspired by the elements. After dinner, a charity auction raised money to help people displaced by the floods. Both events combined raised over THB320,000, which will be go to flood victims as well as continuing the pioneering work of the Pure Blue Foundation in supporting damaged marine environments in Thailand. At the first event, visiting chef Laurent Reveillac thrilled an enraptured crowd with his excursions to the edge of culinary creativity. The French-born chef has wowed everyone from Cirque du Soleil audiences to royals and tycoons with his spectacular molecular cuisine. Guests were abuzz with the novel tastes French-born chef Laurent conjured through clever use of liquid nitrogen and unexpected combinations of ingredients, including Revelation a la Minute Nitrogen Foie Gras, Sushi Glace with salmon sashimi, ricepop and japanese bubbles, and Goat Save the Cheese, featuring goat cheese nougat, thyme jelly and crispy honey candy. Before dinner, guests released dozens of green turtles back into their native habitat as a symbolic gesture of restoration and conservation. All money raised at the dinner went towards the Pure Blue Foundation, brainchild of Aleenta Resorts founder, Anchalika Kijkanakorn, which was set up to rebuild damaged coral reefs and protect the Andaman Sea's endangered turtle species. A week later in Pranburi, a very exclusive gathering saw chefs from neighbouring resorts join hands with Aleenta to create a five-course menu inspired by earth, wind, fire and water. Each dish also reflected the resort's commitment to use as much locally grown produce as possible as well as its partnership with Adams Organic, a leading organic produce supplier. The dinner itself was a romantic and sumptuous affair, featuring dishes such as Fired Salmon Sashimi with flambéed shrimp bolognaise, wasabi caviar and aged soy paint, Textured Tomato, a tomato consomme with sundried tomato jelly, white tomato ravioli and tomato pearls, Ground Roasted Tandoori Rock Hen, and white chocolate and rosewater mouse. A mystery 'fifth element' veered into molecular gastronomy territory, featuring chocolate, marshmallows and liquid nitrogen. 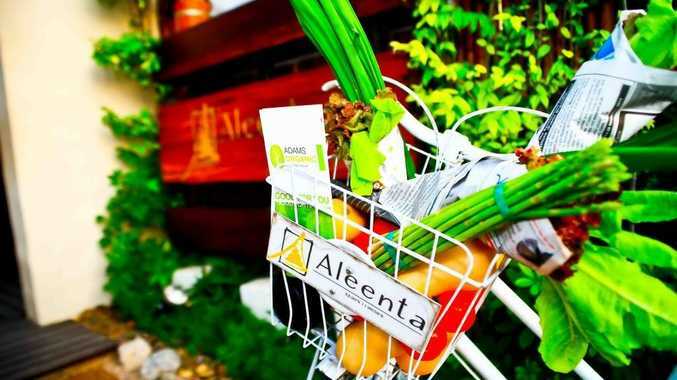 Aleenta Phuket-Phang Nga hotel manager Yann Gouriou said Aleenta would continue to build on its reputation for innovation and style while always being committed to giving something back. Ms Anchalika said she was delighted with both events and pleased with the money raised. She was also grateful to Small Luxury Hotels of the World for putting up free stays at any of their global properties as auction lots. "These were two very different events. "Phuket was more glamorous and action packed, while Hua Hin was a more exclusive and reflective occasion. But both are evidence of our commitment to putting our money where our mouth is when it comes to marine conservation and helping those less fortunate than ourselves. "Based on the success of the events and the fantastic feedback, I'm sure we'll be coming up with more cutting edge culinary concepts to help good causes, particularly the Pure Blue Foundation, which does great work and is an absolute passion of mine," Ms Anchalika said.